Part two of a series of blogs that attempts to explain a coherent model for planning in primary. 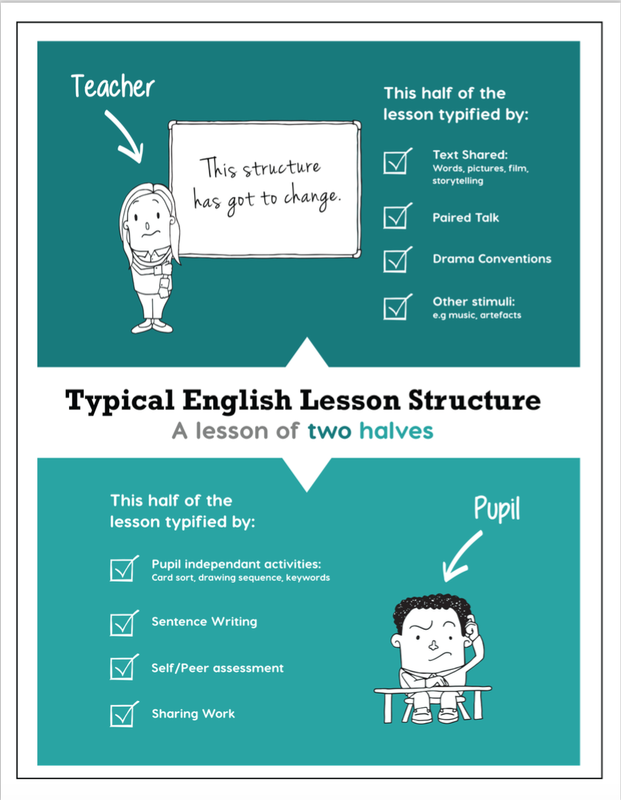 Many English lessons fall into being a lesson of two halves. The first half being the teacher half that is a stimulating time, full of engaging moments that is punctuated by paired talk. The other half being the activities that the pupils are involved in and these are invariably writing based. If we are being observed, we might find time for a plenary but if not it might be a part of the lesson which ‘falls off the end’. 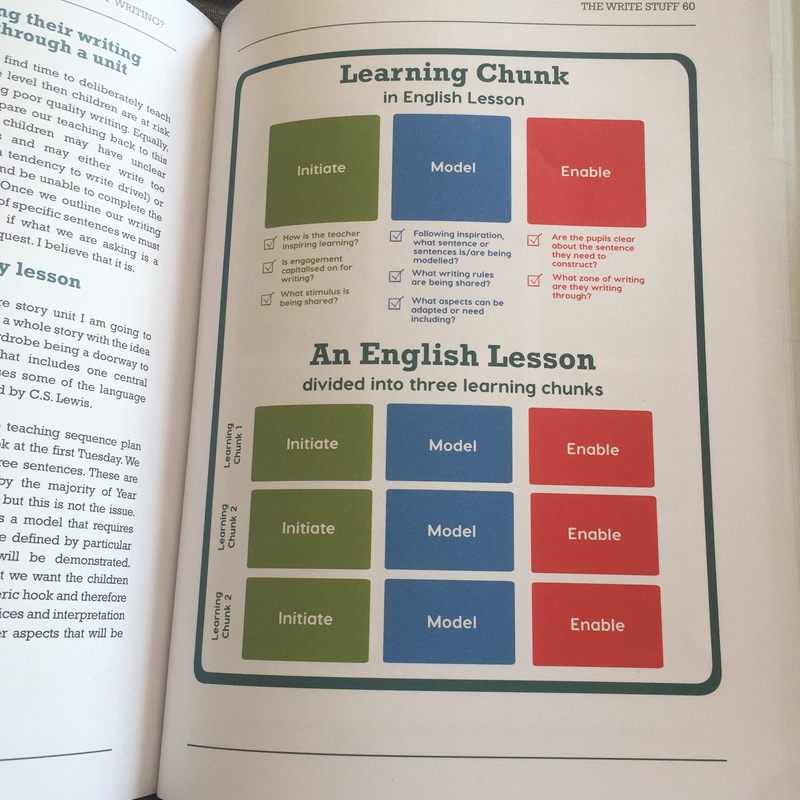 In my experience, after closely considering the commonalities between successful lessons there appears to be a similar approach of breaking a lesson into smaller learning chunks. In English writing lessons these chunks are most productive if they are underpinned with the purpose of crafting and constructing sentences. The nature of an initiate aspect can take any form. A text extract to analyse, drama convention to explore characters further, a soundscape to recreate an environment, a film clip to provide a shared plot point or a powerful image to stimulate ideas. Quite frankly, this part of the lesson can be packaged in any way but must serve the purpose of rinsing from it a word and phrase bank that provides a wealth of choice before a model is introduced. Teachers often talk to me about pupils being over-reliant on a model and ‘just copying it’. To avoid this trap modelling must be presented as a generic construction where the rich word and phrase bank collected previously can be applied to generate various different outcomes but still fulfil the guiding principles locked in the model. It is at this stage teachers need to be crucially aware that the model can be driven through an ideas lens, a grammar lens or a technique lens. The ideas lens from the children’s perspective is known as the FANTASTICs that captures the nine ideas for writing. The grammar lens is known as the GRAMMARISTICs and the technique lens are known as the BOOMTASTICs. This empowers the breath and strength of our model so it entwines all the aspects that contribute to skilled, precise writing whereby there are high levels of control around content, tools and effects. One movement through this process is defined as a learning chunk for writing.The most effective lessons move through this process three times on average in an hour lesson which will yield three writing chunks that could equate to three sentences or maybe more across lesson depending on how many sentences become the goal at different learning chunk points. I have built a unit planning tool that correlates to this planning method that will save you valuable time. It is free to download. I have also uploaded some exemplar unit plans that I have written to refer to in your own planning, or to use in your teaching. Click here to download. Please feel to contact me on jane@thetrainingspace.co.uk if you have any questions or require any further assistance with this planning approach.